Summary & Setting: The Clough H. Rice House is located on a two-thirds acre parcel of land one and a half miles to the north of the center of Hendersonville, the county seat of Henderson County, in the mountainous western region of North Carolina. The property sits on the south side of Stoney Mountain Road, less than one tenth of a mile west from the intersection of Stoney Mountain Road and Asheville Highway. A short gravel drive leads form Stoney Mountain Road to the house, running up a slight hill in a northwest direction paralleling Stoney Mountain Road. The house sits on top of the hill and is visible from the road below, though partially concealed by trees along the northeast edge of the property. The property consists of the Clough H. Rice House and a non-contributing single-story garage on the rear, northwest edge of the property. The property is visually divided by a row of massive boxwoods that were planted in front of the Clough H. Rice House, parallel to the facade. These plantings obscure the first story of the house from view as the house is approached from its private drive. The house and garage are on the west side of the boxwoods and to the east of these bushes is an open, grassy area framed by a massive magnolia tree next to the gravel drive and a ring of hydrangea bushes on the opposite side of the lawn. The gravel drive follows the north property line to just beyond the boxwoods and then turns to the southwest and runs between the boxwoods and the house. Since its construction circa 1875, the Clough H. Rice House has undergone modest changes and stands today as Hendersonville's most intact example of a rural 1-house constructed in the latter years of the nineteenth century. For the purpose of this nomination the facade is the east elevation, the rear is the west elevation, and the side facing Stoney Mountain Road is the north elevation. Exterior: The Clough H. Rice House is a weather board, single-pile, two-story, side-gable 1-house with a bay window on each of the side (north and south) elevations and a two-story, gable-roofed rear ell. The foundation is a rubble masonry wall of fieldstone under the main block and a pier and curtain wall under the ell, with stone piers at the ell and brick piers underneath the porch along the south elevation. Granite blocks are laid with a grapevine mortar joint between the piers. This same detail is found on the south porch and on the ell's west end. Windows are predominantly two-over-two wood double-hung with exterior storm windows, trimmed with flush wood surrounds, with a drip molding across the top, and plain wood sills. All outside corners are finished in flat corner boards with caps converging on a three-quarter round molding at the outside edge. Comer boards run from the top of the drip edge above the sill to the underside of the tall flat cornice under the eave. While the bay windows are roofed in wood shingles the rest of the house and its porches have metal roofs. Two stone interior chimneys with corbelled caps, one on the ell and one on the south end of the main block, serve seven fireplaces. The balanced three-bay facade faces east and is dominated by a full-facade single-story hipped­ roof porch with a central single-bay front-gabled second-story porch. The roof of the single-story porch is supported by square wood columns on square wood bases with molding. While these columns are modem replacements, the original chamfered pilasters remain. The porch is finished in tongue-and-groove wood flooring and a bead-board wood ceiling. Under the protection of the porch is a center single-leaf paneled and glazed wood entry door with rectangular transom, and a single window to each side of the door. Between square columns of the second-story porch is a simple railing with square balusters. The gable is finished in vertical bead-board siding with a centered louvered gable vent consisting of two narrow round-arched vents protected by a drip mold. As below, the porch roof protects a paneled and gazed door with transom leading from the second-floor hall to the porch. A tall flat cornice board runs below the facade's eave and returns on the gable ends of the main block. The side (north and south) elevations of the main block are identical with a bay window on the first story, a centered window in the second floor and a gable finished in vertical bead-board siding with a centered gable vent. The two-story ell projects off the southwest corner of the main block. A single-story L-shaped porch (enclosed in the 1920s) fills the inside comer created by the main block and the ell. This hipped-roof enclosed porch repeats the comer board details found on the main block. On its north elevation is a smaller two-over-two double-hung window, believed to be added when the porch was enclosed. The enclosed porch's west elevation has one two-over-two double-hung window in its north/south leg. This window was most likely originally on the first story on the rear (west) elevation of the house and moved to the outside wall when the porch was enclosed. On the west elevation of the east/west leg is a smaller, fixed window with recently installed stained glass. On the rear (west) elevation of the main block the tall cornice board is repeated under the eave and above the single-story enclosed porch are two-over-two double-hung windows. These details are carried around to the north elevation of the ell, where a small two­over-two double hung window is on the first story and three two-over-two double-hung windows are located on the second-story. The end gable located on the west elevation of the ell is finished in weatherboard siding and void of the decoration found on the front and side gables of the main block. On the south side of the ell is a single-story hipped-roof porch that runs the length of the ell and ends at the bay window on the south elevation of the main block. This elevation also repeats the tall cornice board under the eave that is found on the main block and the north elevation of the ell. At the west end of the porch is an enclosed storage room, accessed from the porch through a paneled wood door on the room's east elevation. The storage room's small window on its west elevation is partially obscured by the metal shed roof of a small grade-level enclosed room attached to the storage room's west elevation. This enclosed room with exposed rafter tails is entered through a paneled wood door on its south elevation. A wide set of wooden steps under a shed roof with chamfered posts and an exposed roof system rise from the west to the east, terminating at the west end of a porch with a slab floor supported by a granite foundation wall and sheltered by a shed roof supported by square chamfered wood posts. The porch floor and roof match those of the porch on the facade, the porch ceiling is flush. A paneled and glazed wood door with transom lead from the porch to the living room at the east end of the ell and a second, shorter paneled and glazed wood door leads to the mudroom inside the west end of the ell. Between these two doors are paired two-over-two double-hung windows. 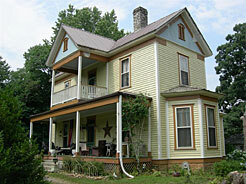 Above the porch in the second story are three two-over-two double-hung windows. changes have been removed within the last five years and the porch, while still enclosed, is now one room that serves as the kitchen. To the west (rear) of the parlor is the living room, with a small laundry room and bathroom beyond in the west end of the ell. A door on the north wall of the parlor leads to a closet under the stair, as does a door on the east wall of the living room located on the north side of the fireplace. to a landing, then turns to the east and rises to the second-floor hall. The second-floor hall runs in a north/south direction with a bedroom at each end and a third bedroom off the west side of the hall. A door leads from the hall to the second-story porch on the fa9ade. On the west side of the intermediate stair landing is a door that leads to a short flight of stairs rising to the west to the master bedroom and bathroom, located in the second floor of the ell The chimney that serves the fireplaces in the south bedroom and the master bedroom is enclosed between the west and east walls of these rooms respectively. The balance of the space between these two walls provides a closet for each room, accessed by a closet door on the south side of the fireplace in the master bedroom and the same on the north side of the fireplace in the south bedroom. The floor, wall, and ceiling finishes of the house are for the most part original, although some significant deterioration has occurred due to water damage, resulting in the replacement of some finishes. Original flooring exists throughout the majority of the house. Original random-width pine floors are in the center hall, the living room, and the new laundry room and bathroom in the western end of the ell. The parlor floors were significantly deteriorated and had to be removed. Plywood subfloor has been installed and new pine flooring that matches the pine flooring in other areas of the house will be installed in this room. The dining room floors are oak over pine, and new pine floors exist throughout the kitchen. Original pine floors are throughout the second floor. The original plaster walls with horse hair remain in the center hall, dining room, kitchen, living room, stairway walls, and second-floor bedrooms and bathroom. The parlor walls are sheetrock. Original plaster ceilings remain in the center hall, living room, laundry room and bathroom, and upstairs bedrooms and bathroom. The plaster ceilings in the parlor, dining room, upstairs master bedroom and bathroom in the ell were deteriorated beyond repair and have been replaced with bead-board ceilings. The bead-board ceiling in the kitchen (former porch) is original The plaster medallion in the center hall is original The medallions in the parlor and dining room have been added. The interior doors and the majority of the woodwork are also original Tall wood baseboards with small cap mold are intact throughout all rooms. The original bead-board wainscot remains in the center hall and dining room, with the original chair rail in the center hall and a new chair rail in the dining room. (The original dining room chair rail was removed years ago when the walls were covered with sheets of (paneling.) The walls in the north part of the kitchen have retained their horizontal bead-board paneling. The center hall door openings are trimmed with original molded door casings, plinth blocks, and bulls-eye comer blocks. The door casings in this space are interrupted by a molded block installed as part of the casing where the chair rail butts into the side of the casing. Throughout the rest of the house the door and window casings are flat and void of plinth and comer blocks. The one exception is the door casing and comer blocks at the door leading from the living room to the side porch. In this case the casings are fluted and the comer blocks are much smaller with stars, most likely a later addition. In rooms where wood ceilings have been installed a new dentilled crown has been added to conceal the joint between the walls and the ceiling. The interior doors are original four- raised-panel doors. Most of the door hardware is original, including the hinges. The front door and master bedroom door are both hung with German hinges. Rectangular transoms are located over the doors leading from the center hall to the dining room and kitchen, and from the kitchen to the living room. Throughout the Clough H. Rice House are seven fireplaces with original stone hearths and fireboxes, and mantels with capped flat pilasters. The most elaborate mantel is in an unusual location, the center hall, and displays its original over-mantel. The mantel shelf is supported by paneled and chamfered pilasters. The other six fireplaces are located in the dining room, parlor, living room, master bedroom, and north and south second-floor bedrooms; each has a plain mantel shelf supported by sawn brackets in pairs at the first floor mantels and single brackets at the second floor mantels. The interior stair in the center hall is highlighted by a square newel post finished in bead-board paneling with applied diamond-shaped wood moldings on the sides of the post. The post is capped by stacked graduated square wood blocks. Bead-board wainscot runs along the stair on the adjacent west and south walls. The solid bead-board balustrade is capped with a rounded handrail. While the actual date of the newel post and balustrade are unknown, they are not believed to be original to the center hall. 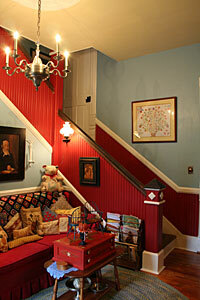 The stair itself is finished with stained treads and painted risers. Statement of Integrity: The Clough H. Rice House is a well-preserved example of a late nineteenth-century rural 1-house in Henderson County. When the present owners purchased the house it was significantly deteriorated due to water damage. The restoration has been undertaken with great respect for the repair and preservation of original materials and is in keeping with the Secretary of the Interior's Standards for Rehabilitation. The original interior plan has also been kept intact while incorporating modem conveniences, such as additional bathrooms and a modem kitchen, into earlier spaces. Overall a significant degree of architectural integrity has been retained. Archaeological Potential: The structure is closely related to the surrounding environment. Archaeological remains, such as trash pits, wells, and structural remains which may be present, can provide information valuable to the understanding and interpretation of the structure. Information concerning patterns of land use, social standing and mobility, as well as structural details, is often only evident in the archaeological record. Therefore, archaeological remains may well be an important component of the significance of the structure. At this time no investigation has been done to discover these remains, but it is likely that they exist, and this should be considered in any development of the property.